"The strategy is simple. Total change" says Graves. "The goal was to step completely out of the style I'd developed and called 'tribal metal' and move into something completely new". Allow me to disagree, Mr Graves! The music of Dead Soul Tribe and, more specifically, of Devon Graves, is, quite plainly, remarkable and immediately recognizable. Having returned from a rather taxing day at work, I opened the door to the sounds of a rolling, charging sound that could conceivably come from no other band than Dead Soul Tribe. 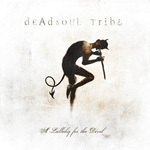 This was the first time I had heard even a single note from 'A Lullaby for the Devil', Dead Soul Tribe's latest mammoth offering to the world of quality metal. The fact that I was immediately able to recognise the music of this band leads me to the above disagreement with the band's mastermind. So why would Devon come out with such a statement? Will he be leaving his now loyal Dead Soul Tribe fan-base behind? No. What any old-time fan of Mr Graves' music will be able to detect is the fact that this is, indeed, a new challenge for this band, but this is not new territory for the author and composer himself. Cast your mind back to days of yore and to an equally ingenious band which went by the name Psychotic Waltz. The fact of the matter is that Devon has infused Dead Soul Tribe's signature tribal feel with the complexity and 'fullness' of Psychotic Waltz' sound and the result really does speak for itself. Devon Graves is true to form on 'A Lullaby for the Devil'. A perfectionist in every way, we have to marvel at the standards he sets both himself and the rest of the band. But the result is clearly audible and that is why I cannot hesitate to say that 'A Lullaby for the Devil' is a work of pure genius in all respects. 'Psychosphere' opens the album and sets the dark and mysterious mood that prevails throughout this fifty four-minute release. The mood is set by down-tuned guitars, a bass section that carries and brings together all the instruments with effortless precision and Adel Moustafa's now unmistakably recognizable tribal beats. 'Here Come the Pigs' is an angry and powerful battering ram, which Devon himself believes sounds like a Rob Zombie composition. 'Further Down' will similarly leave you gasping for breath from its first assault which it carries on with a relentless, fast-paced pounding. 'Goodbye City Life' opens with what can only be described as a broadcast straight from the bowels of hell, introduced by Devon's now famous voice-box which has been a favourite of the artist's from the very early days. "The crowds on the side walk rush by me�While they go where they have to be�And the feeling is so uptight�None of this seems right�Goodbye City Life�" An angry narrative ensues, reminiscent of the type used by Daniel Gildenlow of Pain of Salvation, and is immediately cut short by the nostalgic, reflective 'sound' of the thoughts which come flooding in when we realize that, indeed, "None of this seems right". I give extra credit to Devon for this song, since it has lead me to many philosophical thoughts on my way back from the bustling and often oppressive City of London. 'Fear' is the album's first gentle composition, where Devon's voice has an opportunity to show itself off, so to speak, in the softest of lights. Some interesting Queen-like vocal ensembles in the song also give a 70s feel to this elegant song. 'Lost in You' is one of the most beautiful and intense confessions I have ever heard expressed in music. This is no serenade, but an aching, powerful challenge to a loved one: "Did you ever care for someone? Losing yourself for the love of another one?" The album's pi�ce de r�sistance has to be 'The Gossamer Strand', which is a veritable ode to the flute, where Devon takes this fantastic instrument through its paces and demonstrates his signature sound whilst presumably balancing on one leg. (How else can any decent flautist play this wicked instrument, I ask you?). 'A Lullaby for the Devil' starts with a deceptively gentle sound, with Devon lulling us into his trap, which he springs very soon after, where his inner Demons come spilling out at a chugging pace, serenaded by a an eerie set of backing vocals, which are later echoed by Floyd-esque 'dolphin cries'. I don't think the Devil will be asleep after this one. It has been Mr Graves' cunning plan all along to awaken Him in you and me and anyone else who falls under his spell.